Ralph Waldo Emerson was born in Boston, Massachusetts. Most of his ancestors were clergymen, as was his father. He was educated in Boston and Harvard, also like his father, and graduated in 1821. While at Harvard, he began keeping a journal, which became a source of his later lectures, essays, and books. In 1825 he began to study at the Harvard Divinity School, and the next year he was licensed to preach by the Middlesex Association of Ministers. In 1829 Emerson married the seventeen-year-old Ellen Louisa Tucker, who died in 1831 from tuberculosis. Emerson's first and only settlement was at the important Second Unitarian Church of Boston, where he became sole pastor in 1830. Three years later he had a crisis of faith, finding that he "was not interested" in the rite of Communion. He once remarked that if his teachers had been aware of his true thoughts, they would not have allowed him to become a minister. Eventually Emerson's controversial views caused his resignation. However, he never ceased to be both teacher and preacher, although without the support of any concrete idea of God. Emerson traveled to Europe in 1832. He met William Wordsworth, Samuel Taylor Coleridge, and Thomas Carlyle, with whom he corresponded for half a century. After returning to the United States, Emerson lectured on natural history, biology, and history. In 1835 Emerson married Lydia Jackson and settled with her at the east end of the village of Concord, Massachusetts, where he then spent the rest of his life. Emerson's first book, Nature, a collection of essays, appeared when he was thirty-three and summed up his ideas. Emerson emphasized individualism and rejected traditional authority. He invited the world to "enjoy an original relation to the universe" and emphasized "the infinitude of the private man." All creation is one, he believed - people should try to live a simple life in harmony with nature and with others. "... the currents of the Universal Being circulate through me; I am part or particle of God," he wrote in Nature. His lectures The American Scholar (1837) and Address at Divinity College (1838) challenged the Harvard intelligentsia and warned about a lifeless Christian tradition. He was ostracized by Harvard for many years, but his message attracted young disciples, who joined the informal Transcendental Club, organized in 1836 by the Unitarian clergyman F.H. Hedge. "Nature's dice are always loaded." "The corruption of man is followed by corruption of language." In 1840 Emerson helped Margaret Fuller to launch The Dial (1840-44), an open forum for new ideas on the reformation of society. In 1841 he published a selection of his earlier lectures and writings under the title Essays. It was followed by Essays: Second Series (1844), a collection of lectures annexed to a reprint of Nature (1849), and Representative Men (1850). In these writings Emerson encouraged his readers to trust instinct, to use their potential talents for authentic self-discovery as the great men have done, and to perceive Nature as a source of inspiration and great truths. In the 1850's he started to gain success as a lecturer, and his books became a source of moderate income. His English Traits, a summary of English character and history, appeared in 1856. Other later works include Conduct of Life (1860), Society and Solitude (1870), a selection of poems called Parnassus (1874), and Letters and Social Aims, edited by J. Elliot Cabot (1876). Emerson's health started to fail after the partial burning of his house in 1872. He made his last tour abroad in 1872-1873, and then withdrew more and more from public life. Emerson died on April 27, 1882 in Concord. Appearing posthumously in the 1880's were Miscellanies (1884), a collection of political speeches, and Lectures and Biographical Sketches (1884). As an essayist Emerson was a master of style. "Emerson is God," declared the literary theorist Harold Bloom once, and testified with this the importance of Emerson to American literature. Many of his phrases have long since passed into common English parlance: 'a minority of one', 'the devil's attorney', 'a foolish consistency is the hobgoblin of little minds'. His essays have speech-like characteristics and a prophetic tone, a sermon like quality, often linked to his practice as a Unitarian minister. Emerson's aim was not merely to charm his readers, but encourage them to cultivate 'self-trust', to become what they ought to be, and to be open to the intuitive world of experience. In his essay Books, Emerson advised to avoid mediocrities: "Be sure, then to read no mean books. Shun the spawn of the press of the gossip of the hour. 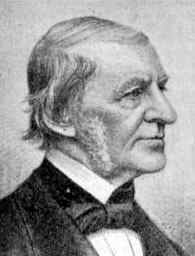 Do not read what you shall learn..." Emerson encouraged American scholars to break free of European influences and create a new American culture. He had formulated this idea in the mid-1830's in a Phi Beta Kappa address, which Oliver Wendell Holmes (Sr.) hailed as "our intellectual Declaration of Independence."